This Catoma Badger Review is about a lightweight, 2.94 lb (1.33 kg), military-style solo shelter suitable for any backpacking and hiking tour. The tent can be fixed on a cot so you have a tent-cot structure. The Badger 1 is the latest product in the series of military-style solo shelters from the Catoma brand. It is a very lightweight hybrid type, single-double wall military style tent. The meaning of the word hybrid is that in some parts of the tent you have a double-wall structure, the mesh, and the fly, and in other sections, this is a single layer waterproof fabric. The Badger 1 tent with the fly partly rolled up. You can deploy this tent literally in seconds. It is freestanding, so you can use it on any surface, rock, concrete, sand, gravel, ice, and you do not have to anchor it to the ground. 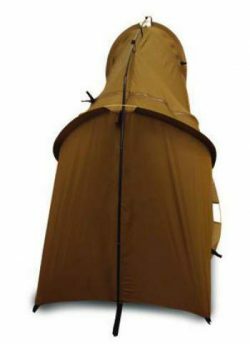 The tent comes in its sack with a zipper, it is with a spring wire in its structure so a retaining compression strap is used when it is in the packed state. It is good to keep it away from your face when you remove the strap. Throw it on the ground and assemble the pole and put its ends into the two grommets at each side of the tent. After that clip the tent body to the ridge pole and the tent is ready. In such a state, you can move it around in the camp and place where you want. You can use the stakes and anchor it to the ground as well, two takes on either of the shorter sides of the tent, partly visible in the picture below. Dismantling is just the opposite. Unclip the tent from the ridge pole, remove the pole, remove the stakes, and fold the two sides to the center and keep it like a suitcase. After that, you will twist the spring wire and fold twice to get the tent to the packed size. Secure it with the strap and put back into its bag. The tent is without standard vents. But there are two doors and it is possible to use one for extra ventilation, as shown in this picture. 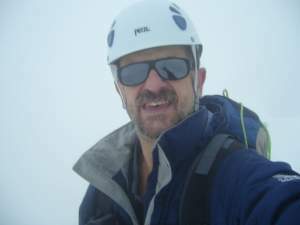 The head view with the main ridge pole and the fly closed. As I already mentioned, the tent is without the classic fly. Instead, you have an extra waterproof layer wherever you have the mesh, and this is in the head area and on the side doors. This fly-layer is fixed to the tent body and you can roll it up and sleep under the stars, as shown in one of the pictures above. On both longer sides, you have long zippers protected by a wide storm flap. So you can roll the fly up and fix it with toggles to the ridge pole, and you again have the net under this part. All seams are taped and the fly and the rest of the tent body are fully waterproof. There are no specific vent openings, but this is not critical as you realize from the picture above, you can use one of the doors for extra ventilation. Both the fly and the floor are durable 70D Ripstop Nylon, and the mesh parts are 20D. All the materials are with embedded permethrin insect protection, and flame retardant. You have around 1.7 square meters of the floor surface, with 33 inches (84 cm) width at one side and 25 inches (64 cm) width at the feet area, so any sleeping pad will fit nicely. But this is a low tent, with 27 inches (68.5 cm) peak height, so you cannot sit inside. This is not so great at all if you are somewhere in the camp waiting for the clear sky to do some climbing. Near the head, there is a small mesh pocket. You have a single shock-corded lightweight aluminum pole which serves as a ridgeline, the tent body, and 4 heavy-duty steaks. Weight: 2.94 lb (1.33 kg). Packed size: 13 x 13 x 3.5 inches (33 cm x 33 cm x 9 cm). Center height: 27 in (68.5 cm). – Length: 90 inches (229 cm). – Width: 33 inches (84 cm) at head, 25 inches (64 cm) at feet. – Floor: 70D Ripstop Nylon. – Fly: 70D Ripstop Nylon. The packed tent is a disk with 33 cm diameter and with such a shape it is not so easy to attach it to any backpack. On the other hand, it does not fit into most of the mid-size packs, like this Osprey Tempest 40 or Kelty Revol 50 pack, they are too narrow for it. *In fact, there is an internal space where you can store your equipment. The prices at the moment of writing the text are $234 and $145, respectively. The Catoma brand has several other shelters, and you can see some of them in the links below. Some of them can be used together with a cot and then you have a tent-cot structure. Those are either net tent (IBNS) or a net tent with a fly (EBNS). The Badger is different in the sense that the fly is attached to the main tent body, so you have the hybrid structure with single and double layers in different sections of the tent. On the other hand, the advantage of the true double wall models (EBNS) is that you have a vestibule which is missing in the Badger. But then you have more weight of course. 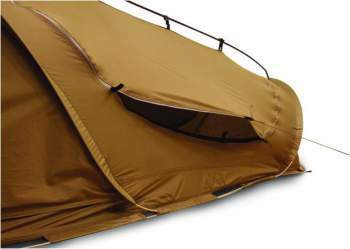 It can be used as a standard solo tent for sleeping on the ground. It can be mounted on a cot from the same brand and used for a comfortable off the ground sleeping, similar to some other models from the same brand. You can see one in this text. I have some objections, so you might bear them in mind if you are in the process of buying a solo tent for you. One tent to compare with the Badger is certainly the Winterial Single Person Tent, built in the same style. There are many solo tents described in the site, see this Alps Mountaineering Mystique 1 Tent as an example, and I would also warmly recommend reading this text with the list of ultra lightweight tents for one person. Thank you for reading. I hope the text has been useful, and if this is so please share it with others. I love to hear from you so please use the comment box below in the case of questions and comments. I wish you a pleasant day.